Preheat the oven to 180ºC, gas mark 4. Butter 6 x 200ml pudding basins and line the base of each with a disc of parchment. Cut 6 squares of kitchen foil, about 15 x 15cm in size, butter one side of each square and set aside. In a large mixing bowl, use an electric mixer to beat 150g of the sugar with the butter, until very pale and fluffy. Gradually add the eggs, then the flour. Strain the ginger, saving about 3 tbsp of the syrup, and finely chop. Peel, core and dice 1 apple. Mix it into the cake mixture with the ginger. Cut the top and bottom from the remaining apple. Cut the apple into 6 horizontal slices. Sprinkle the remaining sugar onto a plate and dip the apple slices in, to coat thickly. Place a slice into the base of each basin. Divide the cake mixture between the 6 basins and level each surface. Cover tightly with the foil squares. Bake in the oven for 30–35 minutes or until risen and spongy to the touch. Leave to rest for 2–3 minutes. Use a sharp knife to loosen the edge of each sponge and turn out. Drizzle with the reserved ginger syrup and serve with dollops of crème fraîche. 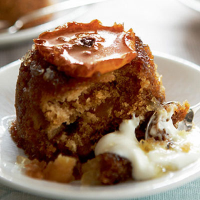 Use smaller apples so that when sliced, the pieces easily fit into the basse of each pudding basin. These desserts can be matched with a luscious Australian Muscat. Try this one, it's fortified, award-winning and simply delicious: Campbells Rutherglen Muscat.